Another happy customer treated the moving crew to lunch today on a hard days work. Crew got done quicker than we thought. Thank you Mr. & Mrs. Ricker, the crew appreciated it and thank you for choosing Brothers Moving & Storage for your moving company. Brothers Moving & Storage offers Full service and labor only options for customers needing packing services, storage, loading, unloading, or full service loading and unloading. Our moving company handles local moves, in-state moves, and long distance moves as well as internal moving. 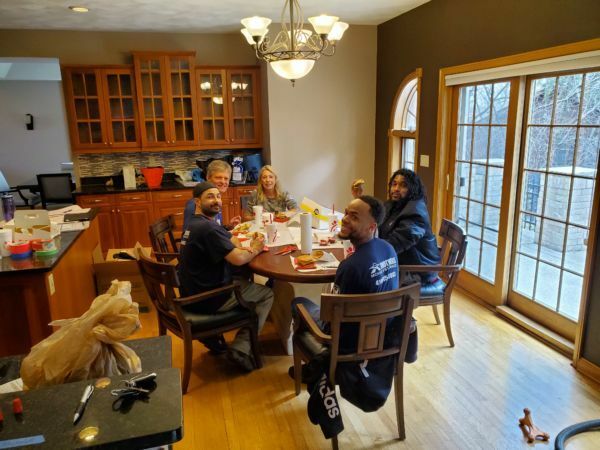 If you are in need of a moving company and would like to be a happy customer as well, visit our Get A Quote page and receive a free, no obligation estimate for your upcoming move or give us a call at 414-815-6683 or email us. Brothers Moving & Storage would like to remind everyone that February is Heart Awareness Month, everyone need to be aware and take care of their heart. During the month of February we would like to remind everyone to know their numbers, this is not just for the month of February but for all time. Brothers Moving & Storage would like you to always know what your numbers are, we are referring to your blood pressure numbers and your cholesterol numbers. In addition, knowing your BMI and your blood sugar will also help your heart. Brothers Moving & Storage cares about all of you and would like to remind you all to keep these numbers in check to help keep your heart in check. On Friday February 1, 2019 we would like to remind you all to wear red and give. Heart disease is the number one killer of women, often times it is the silent killer and women are less likely to get the same symptoms as men. On February 1, 2019 we encourage all women to wear red to help show support of women's health. You can always visit their website and see all the symptoms to look for and how to give to the cause. During heart awareness month, help to spread the word to everyone you know, you can visit this page on their website to get great material to download and share. Brothers Moving & Storage would like to help you with all of your local moving needs whether it is in the Milwaukee area, Waukesha area, or anywhere in Wisconsin. To help reduce your stress which helps with your heart awareness when planning your upcoming move, please give us a call at 414-815-6683, or you can visit our website and click on the Quote tab to get your free estimate today. With heart awareness month this upcoming February, you can help spread the word and get involved.